Disclosure: I received a promotional item to facilitate this post. All opinions expressed are my own. Growing up in Ohio I have fond memories of my dad grilling Johnsonville brats in the summer. Now as an adult when I attend a BBQ and there are "brats" I can always tell an imposter. Mr. Lovebird never quite understood my obsession until he came back to Ohio with me when we were dating and was able to experience them in all their glory. 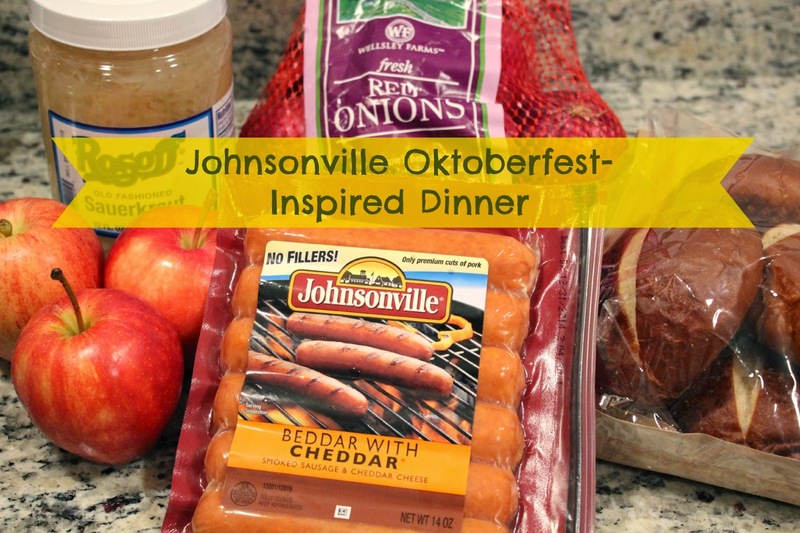 When Johnsonville reached out to me to create a recipe I was thrilled to be able to share their yummy goodness with my readers! I selected Bedder with Cheddar Smoked Sausage Links as the base of my recipe and knew I wanted to go the Oktoberfest route especially being in the midst of apple picking season here in New Hampshire. Next, I decided to add sauerkraut and red onion for sweetness and because of my new obsession with pretzel buns when I saw them at my local grocery store bakery I picked those up too. Prepare sausage according to package - I put them in a skillet with a bit of water. While cooking, in another large skillet swirl a bit of olive oil on medium-low and add apples until softened to desired texture. Put apples in bowl covered with foil to keep warm. Swirl a bit more oil to the pan and add red onion and sauerkraut until onions are translucent and sauerkraut is heated through. Mix back together with apples, salt and pepper to taste and remove from heat. While sausage is finishing broil pretzel buns on low until they're toasted a bit brown on top. 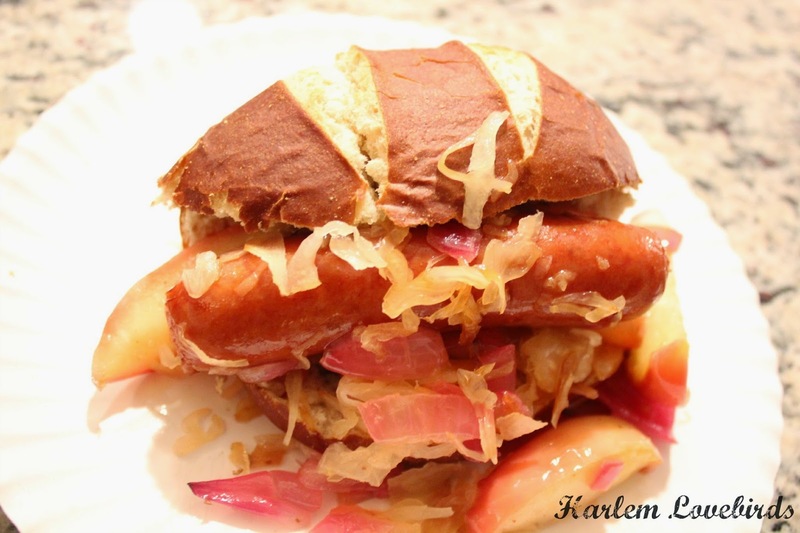 When sausage if finished place in sliced pretzel bun and top sausage with apple/sauerkraut/onion mixture. This recipe was so quick and easy taking less than 30 minutes and Mr. Lovebird enjoyed it so much we ended up having it again a couple nights later! What I love about this meal is the perfect mix of sweet and sour as well as the fact that it fulfills my addiction to cheese, plus the leftovers heat up nicely. Be sure to visit Johnsonville's website and follow on Facebook and Twitter for the latest recipes!